The Behringer Eurolive B212D powered PA speaker puts out big sound at a small price. Featuring an impressive power-to-weight ratio and built-in sound processing, the B212Ds pack a punch yet are easy to transport. And thanks to the cabinet design, the B212D can be laid on its side for use as a stage monitor. It even makes a great single-speaker PA for public address or background music – just connect a microphone or music player and you’re ready to go. And with technology built-in to prevent overloads, you’ll always get a consistent sound from the Behringer Eurolive B212D speakers. High Power, Low Weight: The B212D packs dual power amps for the 12″ LF and 1.35″ HF drivers for a total of 550 watts of peak power in a 32 pound package. 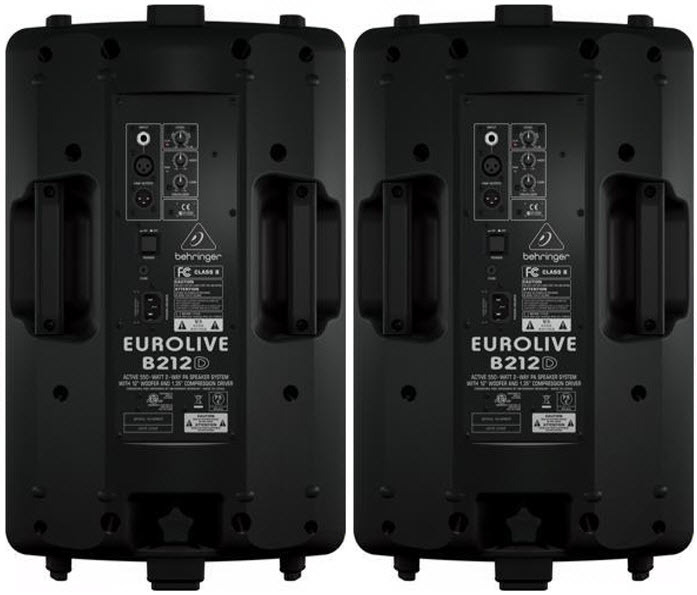 The Eurolive series features Class D amps for maximum efficiency and low operating temperatures, so you can use them all day long without worrying about overheating. Built-in DSP: Behringer’s Eurolive series of loudspeakers feature built-in signal processing to optimize your sound quality. The B212D has an intelligent crossover, EQ, and limiter design to make sure your speakers never overload. As you raise the volume, the crossover and EQ slightly lower bass frequencies to prevent muddiness and distortion. The limiter prevents your input signal from clipping, so you’ll always hear clean audio. Flexible Applications: You can connect a variety of signals to the B212D, making it a very flexible speaker. 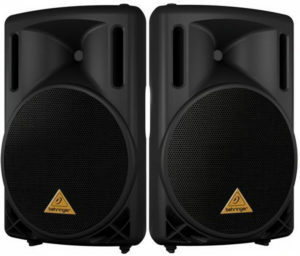 Use a pair of them for your main sound system, or lay them on their side and use them as stage monitors. Or, just connect a single microphone for public address. The B212Ds are even pole-mountable, so you can position them any way you need to.